Ideal to number your documents and mark with your personalised text! The new 55510PL Professional 4.0 self-inking stamp numberer has an impression size of 55 x 32mm. The 55510PL has 10 bands with a character height of 5mm with each one containing digits 0 to 9, plus additional characters including #, %, € and many more on the first band for further versatility of the stamp. The impression also allows up to 4 lines of text, with 2 above and 2 below the numbers, so you can personalise the stamp to suit your company requirements. 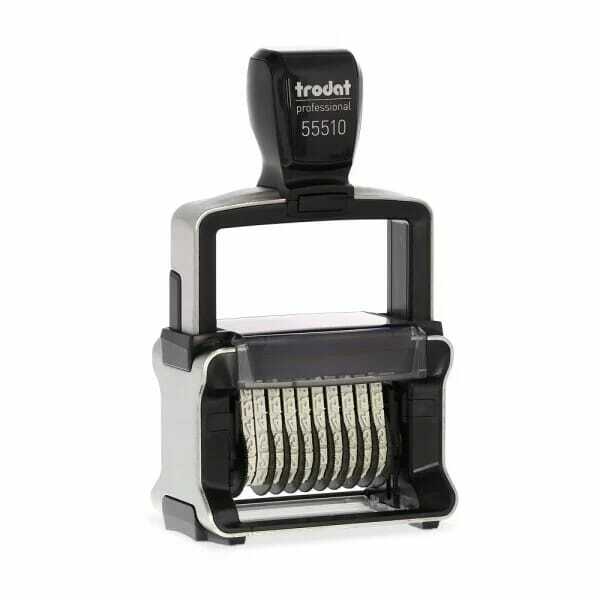 Customer evaluation for "Trodat Professional Numberer 55510PL - 10 bands, 2+2 lines"